Could HPDEs and other open trackdays wind up with a speed limit of 115, 100, or even 90mph? That’s the discussion I’ve been having with veteran instructor-safety advocate Don Salisbury. You can read my interview with him today at R&T Online. Interesting. My no-cage, 20 year old street car is capable of 105 mph at the track I’ve driven, and that was fast enough for that car with me in it. I really want to drive some of the bigger tracks, but I won’t do it without some real safety equipment. But I am a very cautious person..
Great interview. I’ve always thought the “keep it in 2nd gear” was a good idea for everyone but pros if only to keep the focus on safety and driving. Not sure if I know what I am looking at, but does the stuff on that car count as a cage? 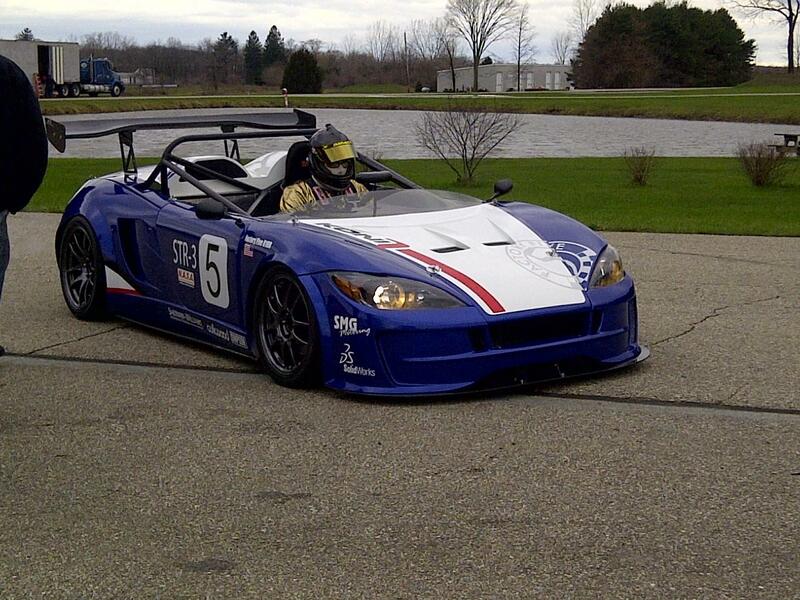 More importantly, isn’t that guys helmet sticking up over the roll bar? I might not know how that stuff works. No, that’s just a plain reinforced roll bar and my head is absolutely sticking up over it. That car was a prototype. Really good article. Some absolute inanity in the comments section below (not here, over at R&T). Seems much of the problem is when the student or novice class driver has more car than ability — and more money than sense. There’s no way a noob should be allowed on track in a Viper, GT3, etc. S/he puts every person’s life in danger: fellow drivers, the instructor, track workers, and of course, their own. Is there a way to match one’s driving credentials to the car? Let’s say I’m a class one racing student/driver — a beginner. I should be concentrating on proper line, braking, throttle and steering technique, track etiquette, etc. Not top speed or personal best lap times. As such, I should be limited to a Class 1 car at any event. Like nothing more than a stock 10-year old Miata, Neon R/T, 240SX, etc. Something that handles and shifts well, doesn’t have (or need) hundreds of horsepower and a deadly top-end, where my instructor can help me learn. After I’ve mastered Class 1 requirements, I move to Class 2 and can drive something faster, maybe a Porsche Boxster or Cayman. Then Class 3 level, etc. But at no time would I be able to take to the track solo or with an instructor in a GT3 until I’ve worked my way up through the ranks. Even if I own such a car, am richer than I am talented or experienced, I don’t get to drive it on a track till I earn it. If I want to see what my GT3 can do, I turn it over to my instructor and I get in the right seat. Watch a pro in action, see how it’s done and realize how far I have to go to get there. Again, Jack: Video of you in car, GoPro pointed at your hands and feet, another behind your head showing the track ahead, split screen and narrated. You can slo-mo through the technical stuff, break it down. Describe the maneuver, the car’s behavior, your input. You could build an entire YouTube Avoidable Contact channel on this. I’m sorry, I can’t let this go; why all the vitriol toward drivers with limited experience tracking high capability/high expense cars? I’m highly confident that you’ve seen my TTAC piece on my first track day in my GT3 – a car you namechecked repeatedly above – and probably Bark’s piece on Jalopnik providing his POV from that day. Both of us emerged unscathed, and I was far safer than most of the people there that day, because I had a trusted friend – Bark – instructing me. David, I’m glad both you and Bark are fine and had a good time. As for GT3, it was just an example, I have a 911 and am a huge Porsche fan. Meant your choice of vehicle no disrespect whatsoever. I’m sure you both conducted yourselves respectfully and skillfully at your trackday event. The point of Jack’s piece with Don Salisbury is not everybody does. In other words, YMMV. Let me ask you this: Is there any racing lesson or concept you could not have learned in anything other than the GT3? (Or Viper? Or Corvette? Or Ferrari?) In fact, would it have been easier in some instances to have learned in a car with less power/performance envelope? Let’s face it, to get your car to 9/10ths of its limits, you will be traveling at professional race car driver speeds. Some people have the fast gene and can process new information and instruction at that velocity. Most of us cannot. Let me put this to Jack and Bark: (David aside) what would you rather your brand new student show up with at the trackday event? A 500 hp supercar? Or a spec Miata? In Bark’s car guy taxonomy, I’d identify myself as mainly as wannabe “weekend warrior.” I’m dying to get back onto the track for an HPDE or even a lower-speed handling clinic. But these days I have a hard time justifying the risk to both my car (as it slowly ages into “classic” status) and my personal safety. I’m glad this issue is getting more attention and hope to see events run with a much greater emphasis on safety. Perhaps then I’ll feel better risk-to-enjoyment factor. For what it’s worth, my experience is that HPDEs do make for safer street drivers. Of course, more highly educated drivers is a good thing, but I also find that people who do HPDEs regularly are less likely to do stupid things on public roads (myself included). So when it comes to the larger issue of automotive safety, I think we shouldn’t discount the importance of educating drivers whose abilities are almost certainly not on par with that of their new Ford ST/M4/Corvette/911. I agree with Don. Outside controls by lawyers, government or insurers in the face of a front-page incident would be infinitely worse. It will take the death of a young, pretty, white mother of 2, but it will happen. Another question for which the answer is always Miata. For better or worse, I cut my track teeth with a C6 Z06 so I probably fit the profile of the artless hicks who show up to “go fast” at HPDE weekends. Here are a few random thoughts on the subject. What is the magnitude of the problem? Is it increasing or decreasing? How many injuries and deaths are occurring per participant/track days? Who is having the most accidents, student drivers or instructors? While I respect Don Salisbury’s years of track experience, I am skeptical of his assertions of a growing problem when no data is presented to support his position. Without data, Don Salisbury just has an opinion. What organization(s) track the accident and injury rates of amateur track events? Google isn’t much help in finding facts and figures. 100 mph isn’t possible at Jefferson Circuit in most cars yet an instructor died there at lower than the proposed speed limits. How would a speed limit have prevented this tragedy? What is the root cause of most track injuries or deaths, mechanical failure, excessive speed, driver error, lack of instructor control, lack of safety equipment??? Where is the data to support the assertion that speed limits, roll cages, HANS devices, fire suppression systems, etc will reduce injuries and deaths at HPDE events from X to X?? Lets look at another “risky sport”, snow skiing. Every year more then 40 people lose their lives in skiing accidents, and “researchers at Johns Hopkins recently estimated that about 600,000 people nationally are injured each year as a result of skiing and snowboarding.” http://unofficialnetworks.com/2013/03/7-surprising-facts-ski-deaths-injuries Look at what happened to Michael Schumacher, yet nobody is suggesting that ski resorts have a big safety problem. BTW, this information is easy to find. Rules are important, but excessive reliance on rules eventually replaces judgement. “Rules are for the guidance of wise men and the blind obedience of fools” Is this what motorsport is about? my initial reaction to track speed limits was pretty much identical to my reaction the first time i read about track noise limits: my eyes did their very best to unscrew themselves from their sockets at a proposition that is, at best, a contradiction in terms. then i thought more about it, took my personal bias out of the equation (i haven’t had a car worth driving on my local road course that would pass even the most lenient tech inspection in years, so i’m not qualified to have a say anyway) and thought about who the rule would benefit vs. who would be doing most of the complaining. sanctioning bodies seem to effectively regulate who can be behind the wheel for actual races (and most of the time they manage to keep the assholes out, right?). everyone in the resulting field has skin in the game, and they understand the stakes and – hopefully – know their limits well enough to avoid the avoidable. but a weekend warrior is out there for shits and grins. he doesn’t think beyond what’s directly in front of his windshield. maybe the possibility of losing it means spending the evening picking grass and dirt out of his car or maybe writing a cringeworthy check and catching a ride home. those that i’ve been around could never accept the possibility that they might not walk away, or that they might put someone else in that unthinkable position. it sounds like, from reading your work and Mr. Salisbury’s comments in the article that it’s all too true and symptomatic of a big change intended to increase attendance and revenue. as much as i hate to see tracks closing at the hands of HOAs and running out of operational funding, i can almost guarantee that they will close a lot faster if you crowd them with idiots and the resulting rate of injuries and deaths rises proportionally. i’d be in good company if i said i’d forfeit every checkbook racers’/trust fund offspring’s ability to brag about REALLY opening up their $100k parking garage-to-parking garage cruiser “ON THE TRACK” to save the life of a single instructor or track worker.